Your casino, at your website! Welcome to your casino! Imagine your customers playing in the casino when they felt like a night of black jack or video poker, or playing some slots while waiting in line. Casino software is a great addition to your sportsbook, and with over 80 games to choose from, your customers will have a virtual Las Vegas at their fingertips. For the past two decades IDSca.com has been providing sportsbook software, and for almost as long, casino software along with it. Offering a casino is a great way to expand your customer base and increase profits. When you partner with International Data Solutions you not only get your own customizable website and toll free numbers, but you also get a full service sportsbook, casino, racebook and in-play platform, along with a fully dynamic mobile platform. 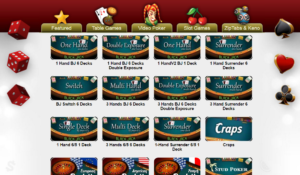 The casino software is well designed and offers 81 games in total. The games feature realistic sounds and images, and each game provides clear descriptions of the rules and game controls as well as a detailed history of all previous games played. There is also a quick spin option for roulette and slots. Whether your customers are in their office, at home, or on the go, the casino will be there, ready for them to roll the dice, or hit the jackpot! We’ve made it easy for your customers to always have access to their favorite games, wherever they are. Each desktop game offers dealer voice, game sound and music toggles, and the mobile version provides easy to understand game symbols with beautiful graphics, to make games fast and fun. With a large selection of games, realistic sound effects and voices, stunning graphics, and a seamless wallet experience, your customers are going to love a visit to your virtual casino. Whether their favorite games are over at the slot bank, or at the card table, there is something for everyone! A large selection of games, realistic table and game graphics, clear table limits, chips based on limits, easy-to-understand instructions for every game, detailed history of every hand, roll of the dice, and pull of the handle, and payout tables for all slots, make this casino software a winner for all. Online casino software functions very much like the brick-and-mortar counterpart. The rules, odds, and payouts are all typically the same and even feature slots with progressive jackpots, bonuses, wilds and scatters. Table games are a big draw at any casino, and your customers will have full access to Baccarat, craps, stud poker, pai gow, poker, sic bo, red dog, war, roulette, and blackjack. Whether your customers are mad for blackjack or any of the other table games, you have complete control of all limits. Set the minimum and maximum per hand, just like at the casino table, and your customer can even enjoy 1 Hand blackjack with 6 decks, double exposure, 1 deck, surrender, switch, 3 hands 6 decks, and 6/5. With 41 Slot games, your customers will have a larger selection than if they were in an actual casino in Las Vegas and the best part is that they can choose their limits for each game with just the click of their mouse. The sound of the reels, the wilds and scatters, the added animations, all combine to make this slot bank a truly magical experience and there will be something for every one of your customers. If you’re not looking to fulfill a high roller’s dream payday, limits can be set up for each player on a daily or weekly win/loss basis, and custom profiles can be set up to restrict or limit certain games, if need be. If you just want to offer slots, then that’s no problem! IDSca has been providing casino software services for 2 decades, and we are ready to give you the casino you want. We want to make sure you are successful with your sportsbook and casino. We can explain the benefit of restrictions on wins and loses, and we’re always available to go over the best profile for each of your clients, or create a group profile. We want everyone to be happy with the casino; this should be a fun addition to your sportsbook offering! Your customers will love being able to use the casino, racebook, sportsbook or live betting wherever they are, but we also made Quick Tools for the bookmaker on the go. Quick Tools is a simple tool for entering deposits and withdrawals, entering transactions and adjustments, changing credit, giving temporary credit, suspending sportsbook wagering, suspending casino wagering, permitting rolling if-bets, setting comments, and changing the detail limits for all sports and line types for every customer. Quick Tools is a powerful Mobile Admin Interface used to assist clients with the most common account maintenance. As well, clients can access standard player information and reports, all while using a mobile device, such as a cell phone or tablet. Why Choose Our Casino Software ? Our dedicated customer service team is on hand to answer any of your customers’ questions about each of the casino games, and to help you get the most out of the casino, as well as all of our other products. To deliver the highest quality of PPH solutions for your business needs, IDSca.com takes pride in putting you and your customers first, and in providing top-notch gaming solutions. Along with a great selection of gaming platforms, IDSca.com provides customized websites and dedicated unique toll-free numbers to each of our clients, triple redundant internet and telephone for 99.9% up-time and no busy signals, and highly trained multilingual operators. For two decades, since 1997, IDSca.com has been the leading provider of sportsbook software, casino software, racebook software, and live betting software to thousands of clients. We are dedicated in providing the most comprehensive service in the industry, and we are as proud of our humble beginnings, as we are of our infinite future.